Enteral feeding is the preferred method for providing complete or supplemental nutrition to patients.1 Europe, the United States, and Latin America each have their own regulations for enteral nutrition (EN) formulas, which are classified as “foods for medical purposes.”2–4 Ingredients used in enteral formulas (EFs) must be carefully appraised prior to administration as patient response to them may influence healing and recovery. Fat composition should be considered on the basis of calorie and fatty acid content and proportion of ω-6 and ω-3.11–15 This is especially relevant when used by the elderly or patients with chronic diseases, such as cardiovascular disease,13 in which prolonged EN is indicated. In addition, polyols such as mannitol and isomalt are also common components in EN formulas and frequently used as sugar substitutes.17 Fiber is an important component of a normal diet. It can be classified as fermentable (soluble) or nonfermentable (insoluble) fiber. Soluble fiber includes nonstarch polysaccharides, inulin, guar gum, oat, and fructo-oligosaccharides (FOS). From the 1National Academy of Medicine, Bogota., Cundinamarca, Colombia. Nutrition outside the submitted work. Carrera 7a. No. 69-5, Bogot., Cundinamarca, Colombia. Last but not least, micronutrients should be selected in varying proportions depending on the type of illness and related deficiencies. Common to all nutrition support practice, ingredients need to be tailored in accordance with patient requirements. Particular attention must be paid to satisfy the complex nutrition needs of the critically ill.
EFs are regulated solely in compliance with Good Manufacturing Practice guidelines used for conventional foods.2 Surprisingly, the labeling requirements are less stringent than those that apply to conventional foods with regard to nutrition facts.2 In Europe, EN includes all “dietary foods for special medical purposes” (DFSMP).28 This definition is taken from the European legal regulation of the commission directive 1999/21/EC of March 25, 1999.3 In the United States, the Food and Drug Administration classifies EFs under the name of “medical foods.”2 The legal definition comes from the Orphan Drug Act of 1988.29 In Latin America, regulations are country specific, and EFs are commonly listed as “foods for medical purposes.”4 Given that EFs are prescribed to patients with differing levels of clinical nutrition risk, an accurate and detailed composition of DFSMP, together with health-related claims, should be provided by the manufacturer. Macronutrients in EFs vary in chemical forms, molecular sizes, solubility, and quality. These characteristics can affect the osmolarity, absorption, utilization rate, and tolerance of the nutrients, which may directly affect patient recovery. Having eliminated common reasons for EF intolerance such as microbial contamination, concomitant medications, and EF temperature, Barrett et al19 considered that formula composition may be an important causal factor. An important overall consideration when selecting an EF is to establish protein content. Some products continue to be marketed as high in protein but may not contain amounts currently considered optimal for patient requirements. Another important issue is the quality of the protein in the formula, which is determined by the relative amounts of essential and nonessential amino acids demonstrated by the seminal work of Rose30 60 years ago. The amount of branched-chain amino acids (BCAAs) also contributes to amino acid balance and protein quality.6,10,31 In addition, the origin of protein should be considered since vegetable protein is not used as efficiently as protein of milk or egg origin.8,32–34 The efficiency of clinical recovery may depend on the type of protein administered.35 High-quality protein derived from animal sources has a protein efficiency ratio (PER), biological value (BV), net protein utilization (NPU), and protein digestibility-corrected amino acid score (PDCAAS) higher than vegetable protein.7,34 These are methods to assess protein quality.36 Therefore, the origin of the protein should be determined since it has the potential to affect not only tolerance but also absorption rate and protein utilization37–39 (Table 1). A protein can be administered in various forms. An EF may provide whole protein, concentrate, isolate or hydrolysate, and free amino acids, even when originating from the same protein source. The selection of protein form as an ingredient in EF depends on various factors, including cost, improvement of the BV, and manufacturing processes. Soy protein is less expensive than whey protein, but soy as an ingredient also affects protein quality and utilization.33,48 Consequently, to improve its quality, it has to be mixed with animal protein such as casein or whey. Another example is collagen, which is an inexpensive animal protein but has low BV, an incomplete amino acid profile (lacks of tryptophan), and meager amounts of essential amino acids.49 Therefore, to compensate for these deficiencies, it is mixed with a high-protein value source such as casein, whey, or even soy. Protein from the same source can therefore be present in EF in different forms that modify the amino acid profile and the presence of other nutrition components. This will lead to different rates of digestion, absorption, and utilization. The relative content of some ingredients varies from one EF to another. For example, whey concentrate has a higher content of cholesterol and lactose, whereas isolates are almost exempt from both50 (Table 2). 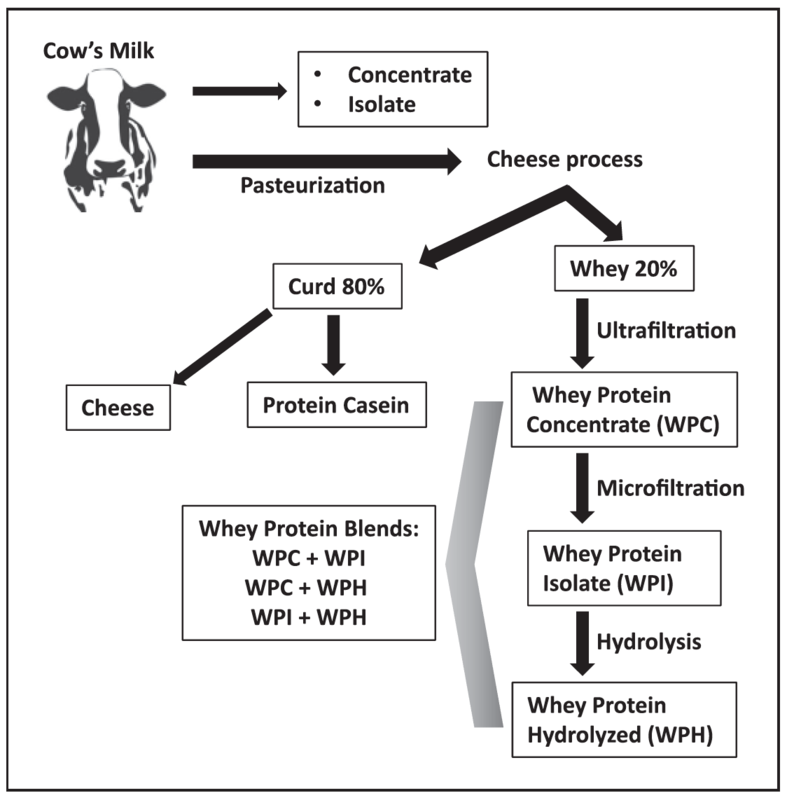 It is also important to specify if the protein and its subproducts are derived from whole milk, casein (80%), or whey (20%)50 (Figure 1). Similarly, the total protein content is higher in soy isolate (>90%) than in soy concentrate (66%–70%).51 Whey proteins contain all the essential and nonessential amino acids and are rich in BCAAs (valine, leucine, and isoleucine), particularly leucine, a key amino acid for protein synthesis. It is also high in sulfur-containing amino acids (cysteine and methionine) that contribute antioxidant properties and enhance immune function.52 These protein characteristics may potentially influence patient recovery and therefore length of hospital stay. Osmolarity must also be taken into account19 since it is significantly increased by the level of protein hydrolysis in the formula; the smaller the molecule, the greater the osmolarity. 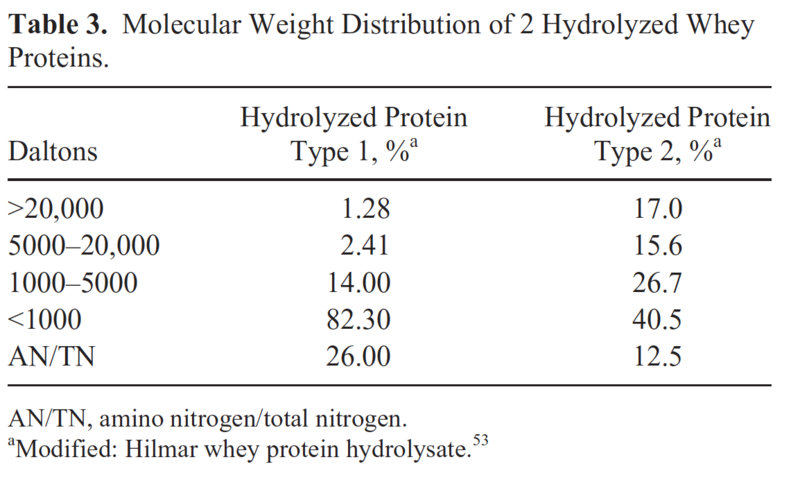 The extent of hydrolysis can modify osmolarity, flavor, absorption, and tolerance depending on the molecular weight distribution, the peptide profile, and the amino nitrogen (AN) to total nitrogen (TN) ratio.53 In Table 3, hydrolysate type 1 is more hydrolyzed since 82.3% of the protein has a molecular weight <1,000 Daltons while hydrolyzed protein type 2 has 40.5%. Figure 1. Scheme for the production of whey and by-products. Whole milk is processed into curd or whey. Whey protein concentrate or whey protein isolate contains intact proteins, but nutrient profiles vary after each filtering step. Hydrolysis facilitates protein absorption and increases osmolarity and cost. Whey protein blends have the properties of its major components. Prior to administration, the proportion, the source (animal or vegetable), and the level of hydrolysis of the EF must be appraised together with the individual amino acids content. These features may change both formula tolerance and cost of the raw ingredients. It is incumbent upon clinicians managing patients to be aware of the protein composition and proportions of an enteral clinical formula. Although it is difficult to know this without chemical analysis, osmolarity can provide a clue to the level of protein hydrolysis present.19 For example, formulas with low osmolarity cannot contain extensively hydrolyzed protein or substantial quantities of free amino acids unless the total protein content is low, is mixed, or has a low level of hydrolysis. Manufacturers are required to provide this information as part of the nutrient profile of the EF. Unfortunately, the EF had important differences from the composition of other macronutrients that could affect patient tolerance and outcome, such as the amount of carbohydrates and the type of fats, hindering the interpretation attributed to the effect of hydrolyzed whey protein (HWP).57 In addition to the degree of hydrolysis, the source of protein may also have an impact on digestion kinetics. Whey protein was shown to stimulate postprandial muscle protein accretion better than casein in the elderly,39 and in young men, HWP stimulated skeletal muscle protein synthesis better than casein and soy protein.58 In a randomized controlled trial comparing the use of whey protein and glutamine, a comparable effect on improved intestinal permeability and integrity of the gut mucosal cells was observed in patients with Crohn’s disease.59 HWP was also compared with casein in a double-blind randomized trial in elderly patients with acute ischemic stroke.60 Patients in the HWP group had higher levels of serum albumin (P < .01) and glutathione (P = .03) and lower levels of interleukin-6 (IL-6) (P = .03), suggesting decreased inflammation and increased antioxidant defenses in this group of patients. In a comprehensive review by Alexander et al,56 the use of HWP in various diseases was shown to improve health and nutrition outcomes. Glucose is a rapid energy source and the only circulating carbohydrate in the body. In a regular diet, carbohydrates should provide 40%–50% of daily calorie intake. It is commonly thought that, with the exception of lactose, carbohydrates are easily tolerated and have no GI side effects. In general, this is true, but lactose intolerance can be present in a substantial part of the population, especially those of Asian, South American, and African descent.71 Poor absorption of lactose, a wellknown FODMAP, can lead to bloating and diarrhea and is generally omitted from EF. Gibson and Shepherd72 in 2005 provided evidence that restriction of FODMAPs prevented intolerance symptoms in patients with functional GI disorders. The presence of carbohydrates, corn syrup, solid corn syrup, FOS (fructans), galacto-oligosaccharides (raffinose), fructose, inulin (higher content with a higher degree of polymerization), and polyols (maltitol) present in some artificial sweeteners16,18 may inadvertently augment the content of FODMAPs in an EF. Short-chain polysaccharides that are poorly absorbed in the human intestinal tract such as FOS, galacto-oligosaccharides (GOS), and inulin17 are very common ingredients added to EFs to provide fiber, without increasing thickness and viscosity.17,18 These fiber sources are also FODMAPs that can trigger GI symptoms. Polyols such as maltitol and isomalt are added to some EFs and, when given simultaneously with fructose, can worsen the tolerance for an EF.16–18 In some cases, fructose is supplied as an individual ingredient, but in others, it is part of the corn syrup or corn syrup solids composition.19 Fructose used to be considered a substitute for glucose, since the first step in its degradation is not insulin dependent. However, this premise was proven false when subsequent steps in its metabolism were shown to require insulin.21,76 Although fructose intolerance with GI symptoms is only seen in those patients with fructose malabsorption, Barrett et al77 reported that a third of 82 healthy volunteers could not absorb a fructose load (assessed by breath hydrogen testing), even in the absence of prior GI symptoms, indicating that intolerance to an EF can be due to the presence of fructose in addition to other FODMAPs. FODMAPs have been shown to produce diarrhea, pain, nausea, and bloating in patients with irritable bowel syndrome (IBS) or with inflammatory bowel disease.17 The removal of FODMAPs in the diet of these patients led to improvement of GI symptoms.72,78–82 EFs have FODMAPs as common ingredients, which are rarely considered a cause of GI intolerance.83 Research done at the Monash University84 revealed that when comparing a regular Australian diet with EFs, the latter could be 3–7 times more concentrated in FODMAPs.85 A retrospective study in 160 patients by the same institution further showed that the incidence of diarrhea significantly correlated with the amount of FODMAPs in the EF.16 Yoon et al20 studied the effect of 3 EFs with different levels of FODMAPs in a randomized, multicenter, double-blind, clinical trial. Low-FODMAP EF was significantly associated with improvement of diarrhea (reduction in King’s Stool scores) relative to moderate-FODMAP and high-FODMAP EF (P < .05). The low, moderate, and high formulas contained 0.320 g, 0.753 g, and 1.222 g total FODMAPs per 200-mL can, respectively. Patients were classified depending on their final condition after the intervention: unimproved, normal maintenance, diarrhea improved, constipation improved, and recurrent diarrhea/constipation improved. In those patients with improved GI symptoms, particularly in whom diarrhea was reduced, a significant improvement was observed for the short-term nutrition markers prealbumin and transferrin. This may indicate that a low-FODMAP formula could improve nutrition status and facilitate prompt recovery, although prealbumin and transferrin may also be considered markers of inflammation.86–88 Halmos18 also considered that a lower content of FODMAPs in the EF could reduce the incidence of diarrhea. Negative metabolic effects are related to the consequences of high carbohydrate consumption and the generation of nonalcoholic fatty liver. The World Health Organization (WHO) and the American Heart Association (AHA) have recommended that the total consumption of free sugars should not be greater than 10% or even below 5% of the energetic intake of a healthy diet.89,90 This means that no more than 100 kcal (25 g) for women and 150 kcal (37.5 g) for men per day should come from added sugars. Although not specifically recommend by the WHO or AHA, these guidelines should also be followed in patients with chronic illness who are being fed at home or on long-term hospitalization to avoid the effects of an unbalanced diet high in simple carbohydrates. Kearns et al,91 in their clinical review, have linked the effect of added sugar on multiple coronary heart disease (CHD) biomarkers and disease development. In their study, they suggest “that the sugar industry sponsored its first CHD research project in 1965 to downplay early warning signals that sucrose consumption was a risk factor in CHD” and “because CHD is the leading cause of death globally the health community should ensure that CHD risk is evaluated in future risk assessments of added sugars.” Carbohydrates constitute the largest energy source in EF, representing between 40% and 60% of the daily total calorie value. Therefore, the type of carbohydrate selected may affect the metabolic profile of the patient. Maltodextrin, a polysaccharide commonly used in EFs, is classified by DEs ranging from 3 to 20.55 Maltodextrins with low DEs have longer chains of glucose molecules and are less sweet and more soluble than those with a high DE (Figure 2). Their osmolarity is 5 times lower than that of glucose. Intolerance to maltodextrins is rare and is dependent on maltase or isomaltase activity at the intestinal brush border as well as by small bowel function.55 Up to now, negative effects of maltodextrin have not been reported. However, high-grade DEs increase osmolarity and the risk of diarrhea given that delivery of water and fermentable substrates to the colon have been shown to be increased by poorly absorbed short-chain carbohydrates.17 The clinician should seek information on DEs from the EF manufacturer. It is my personal view that EFs with high amounts of corn syrup, corn syrup solids, sucrose, and sometimes fructose should be reformulated with other carbohydrate sources (eg, maltodextrins) or alternatively by increasing the amounts of other macronutrients such as protein. The reformulated EF may be better suited to vulnerable populations with a propensity for metabolic diseases such as the elderly, patients with noncommunicable diseases, or when used for long periods. Vitamins and Minerals: Just the Recommended Daily Intake? Thibault et al95 reported a 14% incidence of diarrhea in a mixed population of patients during the first 2 weeks after admittance to a tertiary referral intensive care unit (ICU). They concluded that diarrhea could occur when >60% of the energy target was given by EN in addition to administering antibiotics or antifungal medications. Since they only used fiber-enriched EFs, they questioned whether the number of calories administered could be increased by using fiber-free EFs. They considered further studies were warranted to better understand the causes of diarrhea. Assessment of the different types of diarrhea in the hospitalized patient is mandatory; de Brito-Ashurst et al96 classified them as dysmotility, inflammatory or exudative, malabsorptive, osmotic, and secretory. The composition of the EF is rarely taken into account as a causal factor of diarrhea, since detailed labeling information of the formulation of EF products is scarce or unknown in many cases. Ingredients in EF, such as substantial amounts of FODMAPs, can cause malabsorptive/osmotic diarrhea. This situation may be aggravated by an increase in the amount of formula and thus FODMAPs. For example, 1 cup of milk may be tolerated in the presence of mild lactose intolerance, but on drinking 2 or 3 cups of milk per day, GI symptoms of intolerance may become evident. The selection of an EF should be a conscientious process based on a number of factors, including the patient’s clinical and medical status. The ingredients need to be carefully evaluated in their quality and quantity as they may affect recovery. The content and type of carbohydrates should follow the daily amounts recommended by the WHO. FODMAPs in particular should be assessed since these may be the cause of GI intolerance. Animal protein should be preferred over vegetable sources since utilization and absorption are higher. A balance in the levels of ω-6 and ω-3 fatty acids in the EF may favorably affect the inflammatory response. Additional administration of vitamins and minerals may be required when the volume of the EF supplied does not provide the required daily intake. The selection of an EF should not be determined solely on the basis of the instructions for use provided by the manufacturer; it must result from a judicious appraisal by the clinical team. The author wishes to thank Santiago Uribe-Lewis and Jennifer Uribe for editorial assistance. P. Savino contributed to the conception and design, drafted the manuscript, gave final approval, and agrees to be accountable for all aspect of work ensuring integrity and accuracy. 1. de Aguilar-Nascimento JE, Kudsk KA. Early nutritional therapy: the role of enteral and parenteral routes. Curr Opin Clin Nutr Metab Care. 2008;11(3):255-260. 2. U.S. Food & Drug Administration. Medical foods guidance documents & regulatory information. http://www.fda.gov/food/guidanceregulation/ guidancedocumentsregulatoryinformation/medicalfoods/default.htm. Accessed May 11 2017. 3. EUR-Lex. Commission Directive 1999/21/EC of 25 March 1999 on dietary foods for special medical purposes. http://eurlex.europa.eu/legalcontent/EN/ALL/?uri=CELEX:31999L0021. Accessed January 4, 2017. 4. Savino P. Legislaci.n de los alimentos con prop.sitos m.dicos especiales, APME. Medicina (Bogotá). 2014;36(4):364-375. 5. Valentini L, Volkert D, Schütz D, et al. Suggestions for terminology in clinical nutrition. e-SPEN J. 2014;9(2):e97-e108. 6. Furst P, Stehle P. What are the essential elements needed for the determination of amino acid requirements in humans? J Nutr. 2004;134(6)(suppl):1558S-1565S. 7. Moore DR, Soeters PB. The biological value of protein. Nestle Nutr Inst Workshop Ser. 2015;82:39-51. 8. Moughan P, Gilani S, Rutherfurd S, Tom. D. Report of a Sub-Committee of the 2011 FAO Consultation on “Protein Quality Evaluation in Human Nutrition” on: The Assessment of Amino Acid Digestibility in Foods for Humans and Including a Collation of Published Ileal Amino Acid Digestibility Data for Human Foods. Rome, Italy: Food and Agriculture Organisation; 2012. 9. Keohane P, Silk D. Peptides and free amino acids. In: Rombeau JL, Caldwell MD, eds. Enteral and Tube Feeding. Philadelphia, PA: Saunders; 1984:44-59. 10. Soeters PB, van de Poll MC, van Gemert WG, Dejong CH. Amino acid adequacy in pathophysiological states. J Nutr. 2004;134(6)(suppl):1575S-1582S. 11. Burr G, Burr M. A new deficiency disease produced by the rigid exclusion of fat from the diet. J Biol Chem. 1929;82:345-367. 12. Vanek VW, Seidner DL, Allen P, et al. A.S.P.E.N. position paper: clinical role for alternative intravenous fat emulsions. Nutr Clin Pract.2012;27(2):150-192. 13. Calder PC. Very long chain omega-3 (n-3) fatty acids and human health.Eur J Lipid Sci Technol. 2014;116(10):1280-1300. 14. Calder PC. A matter of fat. JPEN J Parenter Enteral Nutr. 2015;39(7):756-758. 15. Santacruz CA, Orbegozo D, Vincent JL, Preiser JC. Modulation of dietary lipid composition during acute respiratory distress syndrome: systematic review and meta-analysis. JPEN J Parenter Enteral Nutr. 2015;39(7):837-846. 16. Halmos EP, Muir JG, Barrett JS, et al. Diarrhoea during enteral nutrition is predicted by the poorly absorbed short-chain carbohydrate (FODMAP) content of the formula. Aliment Pharmacol Ther.2010;32(7):925-933. 17. Barrett JS, Gearry RB, Muir JG, et al. Dietary poorly absorbed, short-chain carbohydrates increase delivery of water and fermentable substrates to the proximal colon. Aliment Pharmacol Ther. 2010;31(8):874-882. 18. Halmos EP. Role of FODMAP content in enteral nutrition-associated diarrhea. J Gastroenterol Hepatol. 2013;28(suppl 4):25-28. 19. Barrett JS, Shepherd SJ, Gibson PR. Strategies to manage gastrointestinal symptoms complicating enteral feeding. JPEN J Parenter Enteral Nutr. 2009;33(1):21-26. 20. Yoon SR, Lee JH, Lee JH, et al. Low-FODMAP formula improves diarrhea and nutritional status in hospitalized patients receiving enteral nutrition: a randomized, multicenter, double-blind clinical trial. Nutr J. 2015;14:116. 21. Rosset R, Surowska A, Tappy L. Pathogenesis of cardiovascular and metabolic diseases: are fructose-containing sugars more involved than other dietary calories? Curr Hypertens Rep. 2016;18(6):44. 22. Gibson PR, Newnham E, Barrett JS, Shepherd SJ, Muir JG. Review article: fructose malabsorption and the bigger picture. Aliment Pharmacol Ther. 2007;25(4):349-363. 23. Elia M, Engfer MB, Green CJ, Silk DB. Systematic review and metaanalysis: the clinical and physiological effects of fibre-containing enteral formulae. Aliment Pharmacol Ther. 2008;27(2):120-145. 24. Whelan K, Schneider SM. Mechanisms, prevention, and management of diarrhea in enteral nutrition. Curr Opin Gastroenterol. 2011;27(2):152-159. 25. Homann HH, Kemen M, Fuessenich C, Senkal M, Zumtobel V. Reduction in diarrhea incidence by soluble fiber in patients receiving total or supplemental enteral nutrition. JPEN J Parenter Enteral Nutr. 1994;18(6):486-490. 26. Spapen H, Diltoer M, Van Malderen C, et al. Soluble fiber reduces the incidence of diarrhea in septic patients receiving total enteral nutrition: a prospective, double-blind, randomized, and controlled trial. Clin Nutr.2001;20(4):301-305. 27. McClave SA, Taylor BE, Martindale RG, et al. Guidelines for the provision and assessment of nutrition support therapy in the adult critically ill patient: Society of Critical Care Medicine (SCCM) and American Society for Parenteral and Enteral Nutrition (A.S.P.E.N.). JPEN J Parenter Enteral Nutr. 2016;40(2):159-211. 28. Lochs H, Allison SP, Meier R, et al. Introductory to the ESPEN guidelines on enteral nutrition: terminology, definitions and general topics. Clin Nutr. 2006;25(2):180-186. 29. GovTrack. H.R. 3459 (100th): Orphan Drug Amendments of 1988. 1998. https://www.govtrack.us/congress/bills/100/hr3459/text. Accessed May11, 2017. 30. Rose WC. The amino acid requirements of adult man. Nutr Abstr Rev.1957;27(3):631-647. 31. Reeds PJ. Dispensable and indispensable amino acids for humans. J Nutr. 2000;130(7):1835S-1840S. 32. Dietary protein quality evaluation in human nutrition: report of an FAQ Expert Consultation. FAO Food Nutr Pap. 2013;92:1-66. 33. Soeters PB, de Jong CH, Deutz NE. The protein sparing function of the gut and the quality of food protein. Clin Nutr. 2001;20(2):97-99. 34. Wu G. Dietary protein intake and human health. Food Funct.2016;7(3):1251-1265. 35. Marik PE. Feeding critically ill patients the right ‘whey’: thinking outside of the box. A personal view. Ann Intensive Care. 2015;5(1):51. 36. Paddon-Jones D, Coss-Bu JA, Morris CR, Phillips SM, Wernerman J. Variation in protein origin and utilization: research and clinical application. Nutr Clin Pract. 2017;32(1)(suppl):48S-57S. 37. Boirie Y, Dangin M, Gachon P, et al. Slow and fast dietary proteins differently modulate postprandial protein accretion. Proc Natl Acad Sci USA. 1997;94(26):14930-14935. 38. Katsanos CS, Chinkes DL, Paddon-Jones D, et al. Whey protein ingestion in elderly persons results in greater muscle protein accrual than ingestion of its constituent essential amino acid content. Nutr Res. 2008;28(10):651-658. 39. Pennings B, Boirie Y, Senden JM, et al. Whey protein stimulates postprandial muscle protein accretion more effectively than do casein and casein hydrolysate in older men. Am J Clin Nutr. 2011;93(5):997-1005. 40. U.S. Dairy Export Council. Reference Manual for U.S. Milk Powders. Rev. ed. 2005. http://www.thinkusadairy.org/resources-and-insights/resourcesand-insights/product-resources/reference-manual-for-us-milk-powders. Accessed May 11, 2017. 41. Hoppe C, Andersen GS, Jacobsen S, et al. The use of whey or skimmed milk powder in fortified blended foods for vulnerable groups. J Nutr. 2008;138(1):145S-161S. 42. U.S. Dairy Export Council. Reference Manual for U.S. Whey and Lactose Products. 2004. http://usdec.files.cms plus.com/PDFs/2008ReferenceManuals/Whey_Lactose_Reference_Manual_Complete2_Optimized.pdf. Accessed May 11, 2017. 43. Damodaran S, Parkin KL, Fennema OR. Fennema’s Food Chemistry. 4th ed. Boca Raton, FL: CRC Press; 2007. 44. Food and Agriculture Organization (FAO). Protein quality evaluation.Report of the Joint FAO/WHO Expert Consultation. https://blog.priceplow.com/wp-content/uploads/fao-who-protein-quality-evaluation-1991. pdf. Accessed May 11, 2017. 45. Kreider R. Which protein is best for sports performance? In: Aluko RE, ed. Functional Foods and Nutraceuticals. New York, NY: Springer; 2016:42-52. 46. U.S. Department of Agriculture. Composition of foods raw, processed, prepared. USDA National Nutrient Database for Standard Reference.2014. https://www.ars.usda.gov/ARSUserFiles/80400525/data/sr27/sr27_doc.pdf. Accessed May 11, 2017. 47. C.rdenas H, G.mez C, D.az J, Camarena F. Evaluaci.n de la calidad de la prote.na de 4 variedades mejoradas de fr.jol. Rev Cubana Aliment Nutr. 2000;14(1):22-27. 48. Ochoa Gautier JB, Martindale RG, Rugeles SJ, et al. How much and what type of protein should a critically ill patient receive? Nutr Clin Pract. 2017;32(1)(suppl):6S-14S. 49. Castellanos VH, Litchford MD, Campbell WW. Modular protein supplements and their application to long-term care. Nutr Clin Pract. 2006;21(5):485-504. 50. Yuh BE, Nazmy M, Ruel NH, et al. Standardized analysis of frequency and severity of complications after robot-assisted radical cystectomy. Eur Urol. 2012;62(5):806-813. 51. Ma C. Soybean: soy concentrates and isolates. In: Wrigley CW, Corke H, Seetharaman K, Faubion J, eds. Encyclopedia of Food Grains. Vol 3. New York, NY: Elsevier Science; 2016:482-488. 52. Bounous G. Whey protein concentrate (WPC) and glutathione modulation in cancer treatment. Anticancer Res. 2000;20(6C):4785-4792. 53. Hilmar Ingredients. Whey protein hydrolysates. http://www.hilmaringredients.com/products/whey_protein_product_bulletins/. 2016. Accessed May 11, 2017. 54. Silk DB, Grimble GK, Rees RG. Protein digestion and amino acid and peptide absorption. Proc Nutr Soc. 1985;44(1):63-72. 55. Rombeau JL, Caldwell MD. Enteral and Tube Feeding. Philadelphia, PA: Saunders; 1984. 56. Alexander DD, Bylsma LC, Elkayam L, Nguyen DL. Nutritional and health benefits of semi-elemental diets: a comprehensive summary of the literature. World J Gastrointest Pharmacol Ther. 2016;7(2):306-319. 57. Seres DS, Ippolito PR. Pilot study evaluating the efficacy, tolerance and safety of a peptide-based enteral formula versus a high protein enteral formula in multiple ICU settings (medical, surgical, cardiothoracic). Clin Nutr. 2017;36(3):706-709. 58. Tang JE, Moore DR, Kujbida GW, Tarnopolsky MA, Phillips SM. Ingestion of whey hydrolysate, casein, or soy protein isolate: effects on mixed muscle protein synthesis at rest and following resistance exercise in young men. J Appl Physiol (1985). 2009;107(3):987-992. 59. Benjamin J, Makharia G, Ahuja V, et al. Glutamine and whey protein improve intestinal permeability and morphology in patients with Crohn’s disease: a randomized controlled trial. Dig Dis Sci. 2012;57(4):1000-1012. 60. de Aguilar-Nascimento JE, Prado Silveira BR, Dock-Nascimento DB.Early enteral nutrition with whey protein or casein in elderly patients with acute ischemic stroke: a double-blind randomized trial. Nutrition. 2011;27(4):440-444. 61. Gramlich L, Meddings L, Alberda C, et al. Essential fatty acid deficiency in 2015: the impact of novel intravenous lipid emulsions. JPEN J Parenter Enteral Nutr. 2015;39(1)(suppl):61S-66S. 62. Calder PC. The 2008 ESPEN Sir David Cuthbertson Lecture: fatty acids and inflammation—from the membrane to the nucleus and from the laboratory bench to the clinic. Clin Nutr. 2010;29(1):5-12. 63. Rice TW. Gluttony in the intensive care unit: time to push back from the consensus table. Am J Respir Crit Care Med. 2013;187(3):223-224. 64. Swails WS, Kenler AS, Driscoll DF, et al. Effect of a fish oil structured lipid-based diet on prostaglandin release from mononuclear cells in cancer patients after surgery. JPEN J Parenter Enteral Nutr. 1997;21(5):266-274. 65. Hise M, Brown J. Lipids. In: Mueller CM, ed. The A.S.P.E.N. Adult Nutrition Support Core Curriculum. Silver Spring, MD: American Society for Parenteral and Enteral Nutrition; 2012:63-82. 66. Harbige LS. Fatty acids, the immune response, and autoimmunity: a question of n-6 essentiality and the balance between n-6 and n-3. Lipids. 2003;38(4):323-341. 67. Roy CC, Bouthillier L, Seidman E, Levy E. New lipids in enteral feeding. Curr Opin Clin Nutr Metab Care. 2004;7(2):117-122. 68. FDA to allow CHD health claim for omega-3 fatty acids. http://www.medscape. com/viewarticle/783261. 2004. Accessed May 11, 2017. 69. Food and Nutrition Board, Institute of Medicine of the National Academies. Dietary Reference Intakes for Energy, Carbohydrate, Fiber, Fat, Fatty Acids, Cholesterol, Protein, and Amino Acids. Washington, DC: National Academies Press; 2005. 70. Mazereeuw G, Lanctot KL, Chau SA, Swardfager W, Herrmann N. Effects of omega-3 fatty acids on cognitive performance: a meta-analysis. Neurobiol Aging. 2012;33(7):1482.e17-29. 71. U.S. National Library of Medicine. Lactose intolerance. 2017. https://ghr.nlm.nih.gov/condition/lactose-intolerance. Accessed May 11, 2017. 72. Gibson PR, Shepherd SJ. Evidence-based dietary management of functional gastrointestinal symptoms: the FODMAP approach. J astroenterol Hepatol. 2010;25(2):252-258. 73. Hobbs L. Sweeteners from starch: production, properties and uses. In:BeMiller J, Whistler R, eds. Starch. 3rd ed. Burlington, MA: Academic Press; 2009:745-795. 74. White J. Sucrose, HCFS, and fructose: history, manufacture, composition, applications, and production. In: Rippe J, ed. Fructose, High Fructose corn Syrup, Sucrose and Health. New York, NY: Humana Press; 2014:13-36. 75. Corn Refiners Association. 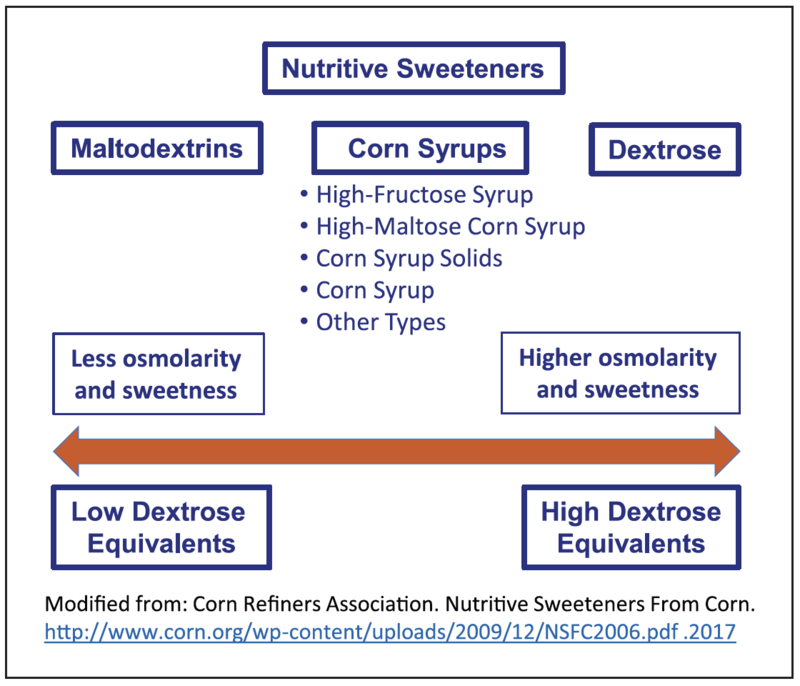 Nutritive sweeteners from corn. https://corn.org/wp-content/uploads/2009/12/NSFC2006.pdf. 2006. Accessed May 11, 2017. 76. Tappy L. How Dangerous is fructose? Medscape. 2015. http://www.medscape.com/viewarticle/852414#vp. Accessed January 4, 2017. 77. Barrett JS, Irving PM, Shepherd SJ, Muir JG, Gibson PR. Comparison of the prevalence of fructose and lactose malabsorption across chronic intestinal disorders. Aliment Pharmacol Ther. 2009;30(2):165-174. 78. Gearry RB, Irving PM, Barrett JS, et al. Reduction of dietary poorly absorbed short-chain carbohydrates (FODMAPs) improves abdominal symptoms in patients with inflammatory bowel disease—a pilot study. J Crohns Colitis. 2009;3(1):8-14. 79. Gibson PR, Muir JG. Non-nutritional effects of food: an underutilized and understudied therapeutic tool in chronic gastrointestinal diseases. J Gastroenterol Hepatol. 2013;28(suppl 4):37-40. 80. Halmos EP, Power VA, Shepherd SJ, Gibson PR, Muir JG. A diet low in FODMAPs reduces symptoms of irritable bowel syndrome. Gastroenterology. 2014;146(1):67-75.e65. 81. Hou JK, Lee D, Lewis J. Diet and inflammatory bowel disease: review of patient-targeted recommendations. Clin Gastroenterol Hepatol. 2014;12(10):1592-1600. 82. Rao SS, Yu S, Fedewa A. Systematic review: dietary fibre and FODMAPrestricted diet in the management of constipation and irritable bowel syndrome. Aliment Pharmacol Ther. 2015;41(12):1256-1270. 83. Thomas JR, Nanda R, Shu LH. A FODMAP diet update: craze or credible? Nutrition issues in gastroenterology, series #112. Pract Gastroenterol. 2012;36(12):37-46. 84. Shepherd S, Gibson P. The Monash University Low FODMAP Diet. 4th ed. Melbourne, Australia: Monash University; 2012. 85. Halmos EP, Liels KL, Rosella O, et al. Enteral and oral nutritional supplement formulas deliver laxative doses of FODMAPs which cannot be predicted by ingredients lists. J Gastroenterol Hepatol. 2011;26(suppl4):73. 86. Ingenbleek Y, Bernstein LH. Plasma transthyretin as a biomarker of lean body mass and catabolic states. Adv Nutr. 2015;6(5):572-580. 87. Raguso CA, Dupertuis YM, Pichard C. The role of visceral proteins in the nutritional assessment of intensive care unit patients. Curr Opin Clin Nutr Metab Care. 2003;6(2):211-216. 88. Shenkin A. Serum prealbumin: is it a marker of nutritional status or of risk of malnutrition? Clin Chem. 2006;52(12):2177-2179. 89. World Health Organization. Sugars intake for adults and children guideline. http://www.who.int/nutrition/publications/guidelines/sugars_intake/en/. 2015. Accessed May 11, 2017. 90. Johnson RK, Appel LJ, Brands M, et al. Dietary sugars intake and cardiovascular health: a scientific statement from the American Heart Association. Circulation. 2009;120(11):1011-1020. 91. Kearns CE, Schmidt LA, Glantz SA. Sugar industry and coronary heart disease research: a historical analysis of internal industry documents. JAMA Intern Med. 2016;176(11):1680-1685. 92. Berger MM. Antioxidant micronutrients in major trauma and burns: evidence and practice. Nutr Clin Pract. 2006;21(5):438-449. 93. Ben-Hamouda N, Charriere M, Voirol P, Berger MM. Massive copper and selenium losses cause life-threatening deficiencies during prolonged continuous renal replacement. Nutrition. 2017;34:71-75. 94. Heidegger CP, Berger MM, Graf S, et al. Optimisation of energy provision with supplemental parenteral nutrition in critically ill patients: a randomised controlled clinical trial. Lancet. 2013;381(9864):385-393. 95. Thibault R, Graf S, Clerc A, et al. Diarrhoea in the ICU: respective contribution of feeding and antibiotics. Crit Care. 2013;17(4):R153. 96. de Brito-Ashurst I, Preiser JC. Diarrhea in critically ill patients: the role of enteral feeding. JPEN J Parenter Enteral Nutr. 2016;40(7):913-923. 97. Reintam Blaser A, Deane AM, Fruhwald S. Diarrhoea in the critically ill. Curr Opin Crit Care. 2015;21(2):142-153.